Last December while traveling around England, we found ourselves in Birmingham and were looking through a travel guide for things to do in town. Cadbury World was there! Heavens to betsy, how I love chocolate. Sadly, the one day we were there was one of the days they weren't open. It's not the part with the boring box factory tour, but it's funny anyway. 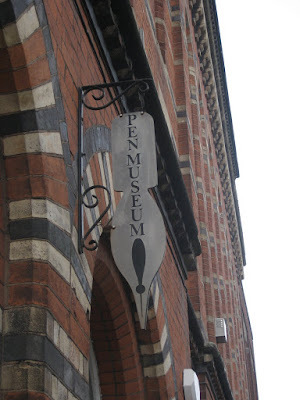 The guide book said the pen museum would take 90 minutes. We scoffed at the notion. 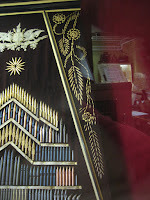 We called to make sure that it was open, after all, how busy could a pen museum be? 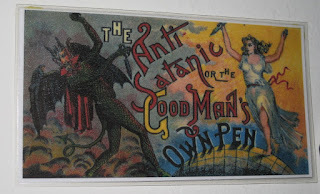 If Cadbury World was closed, why not the Pen Museum for lack interest? As it turns out, they were open. We set off on foot, thinking it would take about 30 minutes. It ended up taking an hour, which made us a little cranky. Way too much effort for a pen museum we were headed for with cynicism. As we entered, the whole museum seemed to be contained in one room. 90 minutes! HA! Try 10 minutes. Or so we thought. The museum was serviced by three volunteers who seemed very happy to help us. 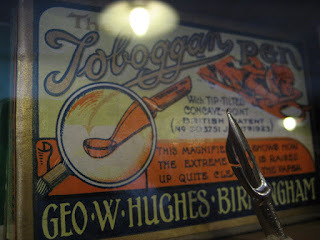 We accepted their offer for a tour and so our journey into the history of the pen began. I'll just state now that this focused only on pens with metal nibs, not going into the ball point pen or anything like that. After the revolutionary war with France had ended, the smiths who crafted weapons were left with not much to do. They headed up to Birmingham as there weren't all the labour and union restrictions up there, so they were free to find work which they were struggling to do in other parts of the country. 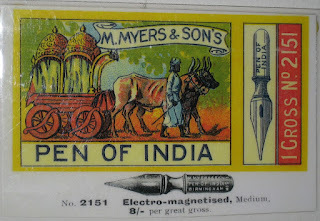 While there, they observed some machinery used in the manufacturing of buttons which they thought could be adapted and used in the making of pen nibs. Now here is the critical part of this story. 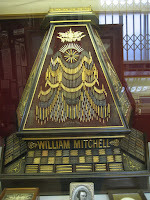 Prior to this time, quills were the only way to write and they were very expensive. One quill cost about £1.25 in today's money which is about the equivalent of what it cost to feed an average family for three months. Yes, folks, three months to feed a family for one pen! Needless to say, since no-one could afford it, only doctors, clergymen and other wealthy people were able to write. Some pen nib box art from my wall. I bought these reproductions and put them on my wall. They are directly in front of my computer. Once the pen nib revolution occurred, pen nibs became very inexpensive with one woman able to handle 18,000 pen nibs in a 10 hour shift! There were four processes to complete a pen nib, each woman handling one process. Women typically worked these machines as their smaller hands and good dexterity was ideal for working with these precision machines. Men had other jobs like preparing the metal and such. So once the pen industry took off, literacy spread like wildfire as now EVERYONE was able to afford the tools to be able to learn how to write! 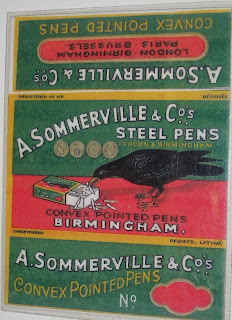 At one point, 75% of the world's pen nibs came from Birmingham! 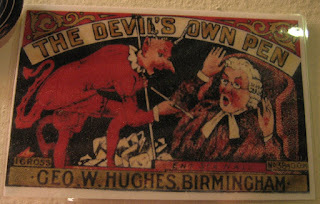 The eventual arrival of the ballpoint pen wiped out the pen nib industry in Birmingham. 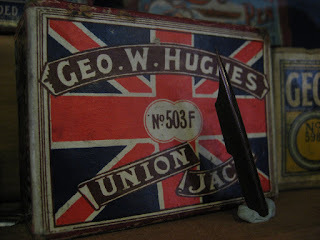 Only a few companies operate on a much smaller scale with nibs for fountain pens. I guess you can fight off Satan with this one. The thing about this whole story that irritates me is the disinterest and the "How boring," looks I've received upon telling this story. People don't seem to realise that even if reading this blog is boring, you are only able to read it thanks to the spread of literacy which we take for granted and for the industry in Birmingham which made it happen! If you still think this whole thing is of no interest, you're an ungrateful douche bag. In the end, we spent about two hours (more than the suggested time) because we loved all the artwork on the old pen nib boxes. I took a gazillion pictures of them and I also got to make my own pen nib using the old machines! We also watched a video which included a tottering old lady who use to work the machines. One of the volunteers was blind and typed "Merry Christmas" and our names on Braille on cards for us. Pen nib art. Everything down to the little leaves are made with nibs. Even I conceded that this is a bit excessive. A very delightful and educational outing, one which I treasure no matter how much of a dork it makes me.